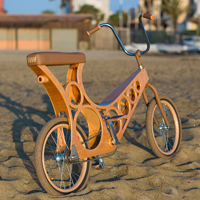 The Hoopy is a 'one size fits all' bicycle but the seat can be raised or lowered during the build if required. It can carry two with ease and will make you friends wherever you go. It's also great to ride. Surprisingly fast and very comfy. 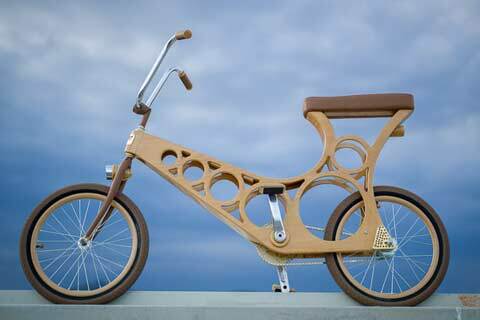 The Hoopy is a lightweight wooden bicycle you can build yourself. It's very comfortable and nice to ride with a surprising turn of speed. Its low frame makes it very easy to get on and off and the strong yet light box section plywood frame allows for an internal drive system, so no more greasy clothes. No mudguards are needed and the frame can be used for storing tools, spares or shopping. The Hoopy would be ideal for conversion to electric with the batteries and motor easily housed in the frame. The design is highly adaptable and allows for much personalisation. 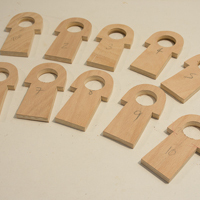 The step by step illustrated instructions walk you through the entire process from selecting wood to how to use epoxy glue. They include a lot of further information on all aspects of the build, from the materials you need and how to find and modify them. The box section frame may look complicated to make but it is surprisingly simple. The frame can be marked up, cut and glued ready for varnish in just two days. Pretty much the only tools needed to make the frame are a drill and a jigsaw. 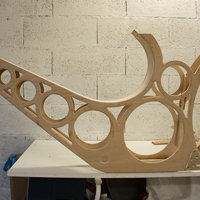 The finished frame weighs from just three kilos and yet is very strong. It is bonded using epoxy glue and there is not one fastener in it. The Hoopy is a one size fits all bicycle suiting most adults of all sizes. However if you wished a more tailored frame then there is the posibility to either raise or lower the frame during the build and full instructions are supplied showing how to find the ideal height and how to modify the design accordingly. The Hoopy is an easy bicycle to personalise as well and the plans explain how to cut your own design in the frame sides and offers discussions and ways to modify your Hoopy to suit you. The Hoopy is made from 10 mm plywood but the plans automatically adapt if you use the Imperial equivilent of 3/8". The simple building jig ensures that the frame remains aligned throughout the build. Two pieces of plywood 120 x 60 cm are needed and there is little waste as the remainder of the frame pieces are made from off-cuts. The photo on the left shows the pieces that make up the head set assembly. 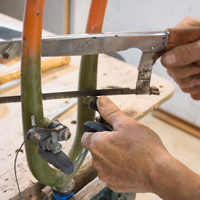 Many of the bicycle parts used to make a Hoopy can be obtained from a salvaged bicycle. The forks come from any 26" wheel bicycle so are extremely common and easy to find. The exception to this is the crank assembly where it is necessary to buy a few new parts which will cost about £100. Even so with care and by using salvaged and secondhand parts it should be possible to build a basic Hoopy for about £250. There is nothing particularly difficult about building a Hoopy but it is a bicycle and even a simple bicycle has many parts. It just takes a bit of time. The Hoopy can easily carry a passenger on the long seat and possibly even another on the cross bar. Try doing that on a conventional bike! The plans show how to fit a single speed rear wheel or the superb 2 speed SRAM Automatix hub. The concise plans contain almost 30,000 words and well over 200 images taken during the actual build of a Hoopy. Q: How long will it take to build my Hoopy? 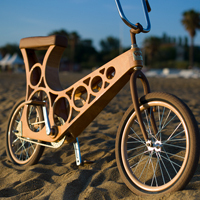 The Hoopy is a quick bicycle to build but even a simple bicycle has many parts. The whole frame can be cut out and glued in just a couple of days but it will take some time to varnish and modify and fit the bicycle parts. A simple Hoopy could be built in about 50 hours. Q: How much will a Hoopy cost to build? Q: Do you sell a Hoopy kit? Q: How much weight can a Hoopy carry? The Hoopy has been tested with three adults or about 200 kilos. Q: Can I adjust the seat height on the Hoopy? The Hoopy works for adults of almost all sizes but you can change the seat height during the build and instructions for calculating the correct height and how to modify the design accordingly are included. Q: What is the ideal rider height for a Hoopy? The Hoopy is a lovely bike to ride. Comments are always favourable and the most common comment is that it's really smooth and comfortable. It is also capable, swift and fun to ride. It is well balanced and easy to ride 'no hands'. Q: How much does Hoopy weigh? A simple Hoopy with a single speed will probably weigh about 12 kilos (26 pounds). The Hoopy shown on this site has lights and a two speed hub and weighs about 14 kilos (31 pounds). Q: How well does it ride? Q: Can I personalise my Hoopy? Most definitely! 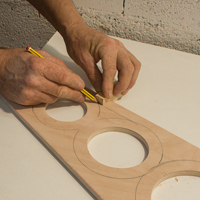 If you don't like the 'Hoop' design you can cut your own shapes in the frame (instructions are supplied). You can varnish it, paint it or even wrap it in vinyl. The possibilities are endless! Q: I don't have any woodwork experience, can I still build a Hoopy bicycle? Yes. If you can follow instructions, have a few basic tools and are willing to 'have a go' the plans will walk you through every single step of the build. 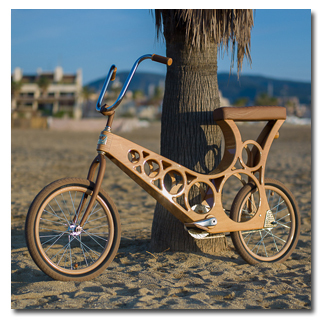 From wood selection to the finished bicycle. Q: What is the Q factor of the Hoopy? The Q factor on the Hoopy is about 220 mm (8-5/8") and although wider than normal is still very comfy and efficient. After all this is not a bicycle for the Tour de France! The metric Hoopy plans have over 130 pages and more than 200 photos and even bonus sections full of useful information. The plans come as a PDF file and are about 14 mb in size. The Plans can be downloaded immediately when you complete your online order. You do not need to have a PayPal account, and you can pay with your credit card. Upon completion of your payment you will be sent an email confirmation with a download link. Save the plans to your hard drive. Max tyre width - 2.2"